1. Prepare barbeque for indirect low heat cooking 245°F (118°C). Remove the tops from the beets. Using a fork, pierce beets all over. Drizzle oil, salt and pepper evenly over beets. Place beets over indirect heat and cook about 1.5 hours or until slightly soft when pierced with a fork. Remove beets from grill and let cool. 2. When beets are cool enough to handle, slip the skins off. Cut the peeled beets into rounds about ½ inch thick. 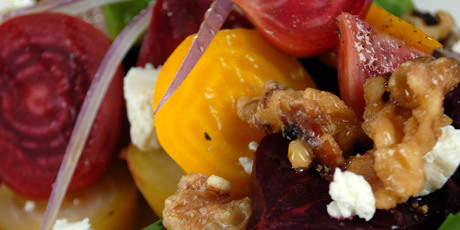 Place beets in a large bowl, drizzle with dressing, and add the basil and read onion. Sprinkle salad with goat cheese and top with walnuts. 1. Combine the olive oil, balsamic vinegar, orange juice, salt and pepper in a bowl. Whisk until all ingredients are evenly distributed.